黑人母亲生下白人宝宝 几率只有百万分之一! 0301-网络课堂,英语学习方法,新概念英语,英语四六级,英语答疑,网络课堂,纯英语交流,英语听力,英语电影,英语歌曲,英语资料,双语故事笑话漫画论坛 - Powered by Discuz! When the midwife presented Catherine Howarth withher new baby, she was convinced she'd been giventhe wrong child. 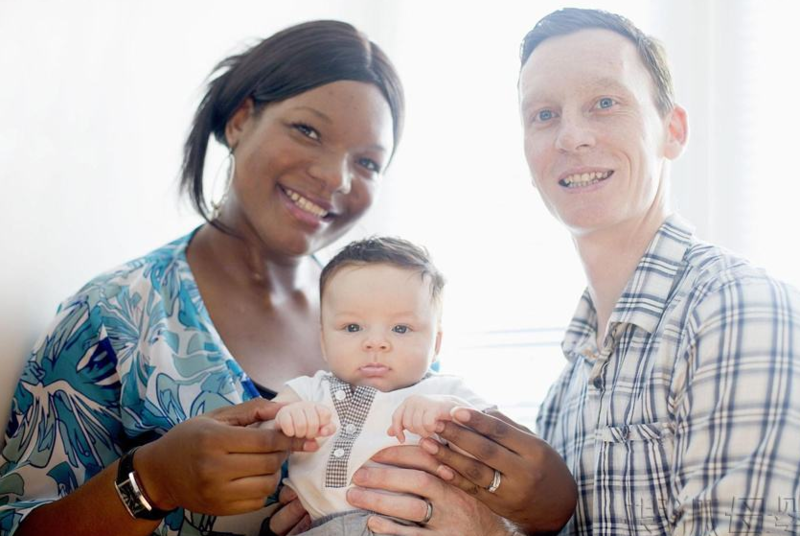 The little boy was completely white – whereas newmum Catherine has the dark black skin of herNigerian heritage. For even though baby Jonah has a white father,doctors say the chances of him being white too were an incredible one in a million. And it wasn't only the "miracle" baby's mum who was stunned. "The midwife looked at me and looked back down at Jonah and then at me again and couldn'tbelieve it," said Catherine, 32. "The doctors confirmed it was extremely rare." Her husband Richard, 34, a medical recruitment consultant, was equally astonished. He hadexpected his son to have darker skin. He said: "When I first set eyes on my baby boy Jonah, it was a feeling of pure delight and reliefthat he was healthy and strong. His complexion was very pale due to the umbilical cord beingwrapped around his neck when he was being delivered." "After a few hours his colour came to his cheeks. Catherine and I noticed his complexion wasvery similar to mine and were surprised it was as light. The midwives and doctors told us he'llmost likely remain this colour."